Here we are going to see practice question on vertices of parallelogram. A rectangle is a quadrilateral in which opposite sides are parallel and equal in length. In other words opposite sides of a quadrilateral are equal in length then the quadrilateral is called a rectangle. How to test whether the given points are vertices of rectangle ? (i) First we have to find the length of all sides using distance between two points formula. 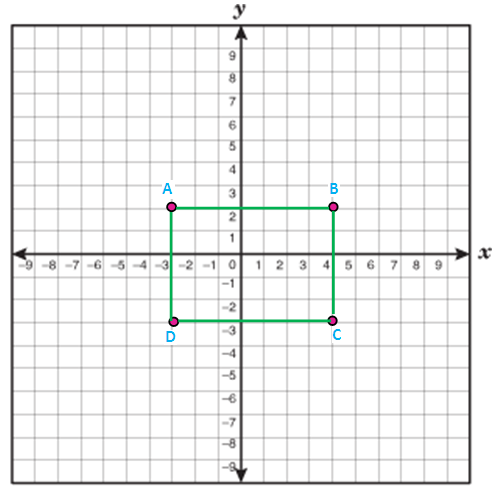 (ii) The rectangle can be divided into two right triangles. (iii) If the given four vertices satisfies those conditions we can say the given vertices forms a rectangle. Examine whether the given points A (-3,2) and B (4,2) and C (4,-3) and D (-3,-3) forms a rectangle. To show that the given points forms a rectangle we need to find the distance between given points. Length of opposite sides are equal.To test whether it forms right triangle we need to find the length of diagonal AC. So the given vertices forms a rectangle. (1) Examine whether the given points A (-3,2) and B (4,2) and C (4,-3) and D (-3,-3) forms a rectangle. (2) Examine whether the given points A (8,3) and B (0,-1) and C (-2,3) and D (6,7) forms a rectangle. (3) Examine whether the given points A (-2,7) and B (5,4) and C (-1,-10) and D (-8,-7) forms a rectangle. (4) Examine whether the given points P (-3,0) and Q (1,-2) and R (5,6) and S (1,8) forms a rectangle. (5) Examine whether the given points P (-1,1) and Q (0,0) and R (3,3) and S (2,4) forms a rectangle. (6) Examine whether the given points P (5,4) and Q (7,4) and R (7,-3) and S (5,-3) forms a rectangle. (7) Examine whether the given points P (0,-1) and Q (-2,3) and R (6,7) and S (8,3) forms a rectangle. (8) Examine whether the given points A (2,-2) and B (8,4) and C (5,7) and D (-1,1) forms a rectangle. After having gone through the stuff given above, we hope that the students would have understood "Vertices of rectangle question1".